The French Fauvist Henri Matisse in 1908 wrote another canvas commissioned by Sergei Schukin. Fauvism as a new artistic direction did not exist for long, but managed to express itself quite brightly in the paintings of painters. This style of performance of the image mixed up several components and gave birth to rich avant-garde pictures. 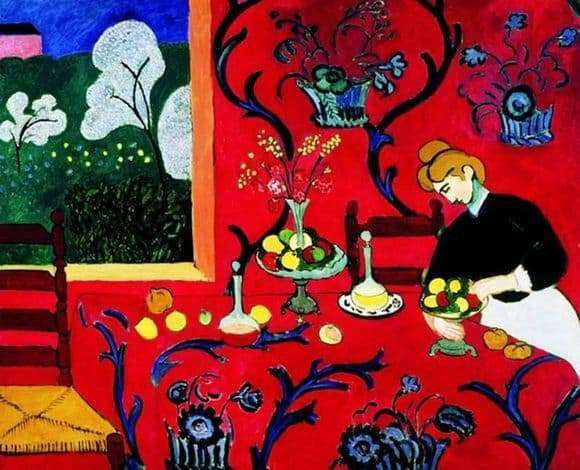 To understand Fauvism, just look at the “Red Room” by Matisse. The artist chose color as the means of expression and transmission of his inner state. As you know the name of the picture, the main color on it is red. Both the tablecloth and the wall are made in the same color scheme. Moreover, even the ornament on these surfaces is the same – dark blue oriental vegetative patterns. The greens outside the window do not extinguish the strikingly bright scarlet hue of the canvas. Small flowers and blooming white branches of trees bring harmony and tranquility to this stunning color picture. Spatial construction is distinguished by primitivism. In the picture there is only a hint of volume and multidimensionality. The flat painted figure of a woman and the trees outside the window are combined with chairs, a table, dishes and a one-story house in the distance, depicted from a perspective. Fauvism set as its task to show the enthusiastic joy of contemplating life. And Matisse in the “Red Room” managed to embody this idea as well as possible. The picture is decorative, energetic, optimistic. Sharp drops of color, elements of ancient art and primitivism are perfectly combined and create a concentrated picture of the original talent of the French master. The interior is blooming with an amazing palette and fruits with drinks on the table are called to enjoy the gifts of life. At first, the work was called “Harmony in Blue,” but the artist subsequently transformed the colors on canvas, resulting in a masterpiece that was loved by many.